Interactivity is the most essential ingredient of an engaging eLearning course. Sans interactivity, eLearning courses lose their gleam and learners just end up hitting Next-Next-Next passively. The only way to ensure that learners are...well, learning...is to involve the learner at almost every step. Present them with a problem they must solve, one that would be similar to that which they encounter on the job. Have them demonstrate that they know why a problem occurs and how to solve the problem step by step. Using this approach means adopting interactivity and varying the interactions you use. 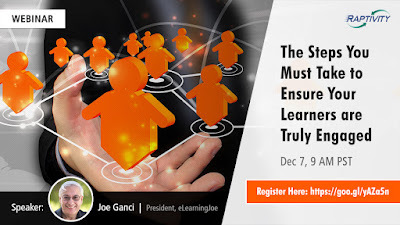 Team Raptivity has coupled up with Joe Ganci, a veteran of 34 years in the eLearning industry, to deliver an insightful webinar focused on interactivity. The webinar, titled 'The Steps You Must Take to Ensure Your Learners are Truly Engaged', is scheduled for Dec 7, 9 am PST. 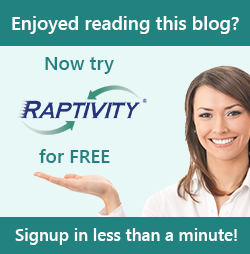 Joe will touch upon the many ways in which interactivity can be created using Raptivity. He will demonstrate how to use several Raptivity interactions in isolation or embedded in larger eLearning lessons to turn courses into engaging experiences. So, grab this amazing chance and be a part of this webinar. You may register here. P.S. You will be welcome to ask Joe any questions you may have, so be sure to attend!